It consists of a simple "Fatiha", and does not require, in some countries, a preliminary civil ceremony. But, in France, some other European countries, and some countries in North-Africa, you need a preliminary civil ceremony. 2 The ceremony of the marriage. 3 Danger for the women with absence of civil marriage. MuslimFriends.com - The best Muslim matrimonial, Muslim dating site. For Muslim woman, Muslim singles, Muslim girls, Muslim men, Muslim personals, Muslim news, Muslim chat.. In Islam we can marry a Jewish or Christian woman, but not a woman who does not believe in God. A Moslem woman has to marry only a Muslim. If her engaged is not muslim, he has to be converted to the Islam to get married through muslim wedding. See Mixed marriage. The polygamy, authorized by the Koran, is forbidden in the occidental countries, and in the certain Moslem countries, as Tunisia or Turkey. In some countries it must be approved by the previous wives. The man owes a dowry, which returns to the wife. Formerly, this dowry returned to the family of the wife. The marriage takes place at parent's house of the engaged girl. At the end of the ceremony of the henna, the girl is exposed in a room, dressed in her most beautiful attires and wearing her jewels, but, only the women can come to admire her. Then, an Imam celebrates the marriage, but in his absence every Muslim can do it. After a prayer to Allah, he asks the father of the girl if he grants to give his daughter in marriage, then to the man, if he accepts her. The girl must also be willing. Finally, invocations are made for the newly-weds. It is of custom, for the feast which follows, to invite poor men in the festivities. Danger for the women and her children of the absence of civil marriage. The only religious wedding: potential risk? According to the results of a study dedicated by Mrs Badra Mimouni, researcher and teacher in social Faculties of Science of the University of Oran, Algeria, to the coverage of the assisted children, 3/4 of the unmarried mothers would have got married, only, in the rite of the recitation of "Fatiha". If the marriage remains, generally speaking, for the women, the ultimate purpose to be reached in the life, nevertheless, contract a marital union, by contenting itself only with the reading of "Fatiha", do not go without pulling sometimes fatal consequences for the woman whose marriage was not transcribed on state registers. Il is thus always of the Moslem monks to celebrate, in illegality, such marriages (no case are known in the other confessions). Except denunciation, and in l'absence of registers, it however appears difficult to locate the faulty ones and, to date, no Imam has condemned. A control is as more complicated to exert than in the Muslem tradition, a religious wedding, which is not a sacrament but a contract, can be celebrated in the sphere deprived by any pious person chosen by the families, under the conditions respects four criteria: presence of two witnesses, of the tutor of the bride, agreement on the dowry, stating of the formula by which the father of married requests the hand of the girl from his father. The reasons which push these young Moslems to have not a civil marriage before the religious one, are often of political order. For the radical Islam, the priority given to the religious wedding enables them to refute the laws of a republic of "kouffars" (not Moslems) and to reaffirm the character protester of their current of thought. "It's, for them, not to make a pact with laws not islamiques", underline Mr. Amghar. The salafists indeed reject any compromising with the western societies where they live, privileging l'emprise of the monk on all the acts of their life. The woman who, meanwhile met herself pregnant, has not other solutions only to give birth under X. She has neither marriage certificate, nor family book to declare the birth to the registry office. For Mrs Mimouni, the only religious wedding is a risk factor. The men, she explains, are very busy. Being in search of the work, they do not hesitate to go from a region to the other one. By settling down for certain time in a region, they contract a marriage. Having savored this marriage, and further to the discovery of the pregnancy of the woman, they take, in their crushing majority, the key of fields, they thus run away to find the freedom and avoid assuming their responsabilities. The ministry of the Religious Affairs and the Waqfs, since December, 2006, and seen the scale of this phenomenon, does not stop educating the imams so that they do not celebrate any more the ceremony of pronunciation of "Fatiha" in case the marriage certificate would not be presented. It goes at first of the safety of the woman and the children there who would arise from the marriage. Without the marriage certificate, these children would enlarge the rows of the children of the public assistance. As regards sensitizing, an enormous work remains to be made. In the evening, the bride-to-be follows an elaborate bathing ritual, during which her feet are washed by her maternal aunt. 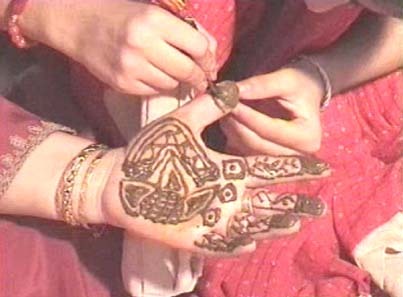 After the bath, her eldest aunt decorates her hands and feet with maenz (henna). Maenz is also distributed among the relatives and neighbours. The women invited for this occasion are served a delicious meal prepared by the waza. Dinner over, all participate in a lively wanvun or music session. In the groom's house, a little mehendi is applied on his hands as it is a symbol of auspiciousness.